We’d love your help. 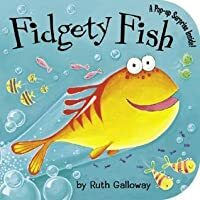 Let us know what’s wrong with this preview of Fidgety Fish by Ruth Galloway. 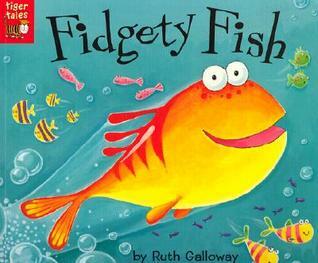 To ask other readers questions about Fidgety Fish, please sign up. Tiddler the fish learns a lesson. The book has great vocabulary words...wriggled, squiggled, glided....and more. Good for kids 3 years old and up. Adorable, brightly colored illustrations with a so-so story. The premise is promising - a mommy fish sends the child fish out to swim off some energy and he manages to get into trouble.... but the execution just isn't that good. Still it's ok... just not great. I like this book but more importantly my 3 year old loves it. Out of the 6 books from the library, this one is picked first each time we sit down to read. The story is cute and silly. It's a great read aloud. I read this book to my girl (3.5 years) and she loved it! She loved all the colorful pages and things in them, she laughed a lot and wanted to re read it many times more! A fidgety fish drives his mother crazy with his fidgeting. When she sends him out to settle down, he quickly gets into trouble! A good selection for fish-themed storytimes. Great for preschool because the pictures are big and bold and the story line is easy to follow. This story is about a fish that just doesn't stop moving. His mom has had enough and sent him out of the house to get all the energy out. He adventures and finds himself in a dark cave, shivers, shakes then BURRRP, he flew out all the way back home. 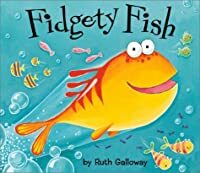 This story wasn't my favorite but it shows very extrovert students to chill and take a breather or they'll find themselves in some trouble like the fish found himself in another big fishes belly. 3 stars, I liked the colorful pictures but not so much This story is about a fish that just doesn't stop moving. His mom has had enough and sent him out of the house to get all the energy out. He adventures and finds himself in a dark cave, shivers, shakes then BURRRP, he flew out all the way back home. Good for teaching children about the different fish and creatures that live in the ocean. This book is about a little fish who can't sit still. Bright, colorful illustrations and big pages make this a great read aloud book to a group. The story is only so-so, but the vocabulary is great and kids will enjoy it. If, hypothetically, you spend time with a small person who happens to really like whales, you'll find this book worthwhile as a bribe to get said small person to sit down. This book is a great one for teachers. In a classroom, no two students are the same. One of your students make relate to this story about being fidgety! 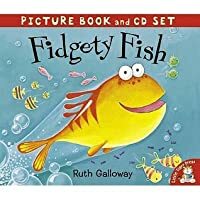 I didn't think it was a horrible book but I didn't think it made much sense really and I thought maybe it would talk more about being fidgety but instead the dish is eaten eventually for having so much energy and I don't feel it's the best message ever really but I found it enjoyable too. It's cute but doesn't seem to make much sense of have a good story. Kiddos loved this for a bedtime story. A book of short poems of different sea life creatures. We acted out some of the "fidgety" fish poems. Tiddler the little fish just can't stop fidgeting. His mom sends him "outside" to work out his energy and he accidentally gets eaten by the big fish. But he fidgets his way out of the big fish's stomach. When he returns home, he at last is out of energy. One of Zaara's favourite reads in the playgroup. She enjoys when Tiddler swims into the big fish. A colourful underwater read! Both my kids really like this one and my oldest has memorized it. Sent out for a swim in the deep sea, Tiddler, a young fish who just can't keep still, sees many interesting creatures and one very dark cave. Beautiful illustrations and choice words make this a must-read for toddlers! It is a cute story. Fish troubles abound! 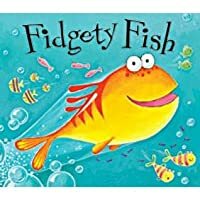 Tiddler a fish who's fidgetiness gets him in trouble and just may be his saving grace, all in the same day, a great book for young ones full of energy. There isn't much of a story here, and what plot there is, is a direct rip-off of the ancient cartoon Small Fry. Although, I seriously doubt the targeted age group will realize this.